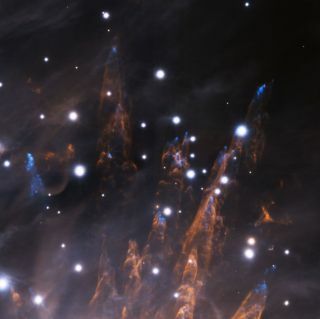 Astronomers have unveiled a spectacular new photo of cosmic "bullets" slicing through thick gas clouds at supersonic speeds in the famed Orion nebula. The so-called Orion bullets are actually enormous clumps of gas packed with iron atoms, scientists said. They appear as distinctive blue features in the new image captured by the Gemini South Observatory in Chile. Each cosmic bullet is about 10 times the size of Pluto's orbit around the sun, researchers said. Pluto is about 49 times farther from the sun than the Earth, which is only 93 million miles (150 million kilometers) away. The new image, which scientists revealed on Wednesday (Jan. 9), was obtained on the night of Dec. 28 using a new adaptive optics system at the Gemini Observatory South telescope in Chile. The system is equipped with five laser guide stars and three deformable mirrors to correct image distortions from the Earth's atmosphere in real time, researchers said. The result is a stunning view of the outer regions of the Orion nebula. "For years our team has focused on developing this system, and to see this magnificent image, just hinting at its scientific potential, made our nights on the mountain — while most folks were celebrating the New Year's holiday — the best celebration ever!" Benoit Neichel, who leads this adaptive optics program for Gemini, said in a statement. Astronomers think the cosmic bullets were ejected from deep within the nebula, likely propelled by strong winds expelling gas at supersonic speeds from a region of massive star formation outside, and below, this image's field-of-view. The gas clumps leave behind tubular wakes as much as one-fifth of a light-year in length, which are the result of molecular hydrogen gas being heated up in the nebula. At 1,500 light-years away, the Orion nebula is Earth's closest known star factory. Scientists suspect the sun was born in a similar environment about 4.5 billion years ago. The Orion nebula’s bullets were first spotted in a visible-light image in 1983, and followed up by infrared observations in 1992. Neichel and his colleagues unveiled the new Orion bullet image at the 221st meeting of the American Astronomical Society this week in Long Beach, Calif.